1 There are many toxic things in the wild that we should stay away from. For example, there are toxic mushrooms. There are toxic frogs. There are toxic fish. There are toxic spiders. And there are toxic snakes. 3 Well, rare as the case may be, there are actually two kinds of toxic birds in the world. The first is called pitohui (pronounced PIT-oh-wheez). And the second is called ifrita. Both happen to live in Papua New Guinea, an island just a bit north of Australia. 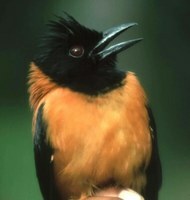 4 In the genus of pitohui, there are several different species. Of them, the most famous is the hooded pitohui. Hooded pitohuis are hard to miss because of their brightly colored outfits (in orange and black). For a long time, scientists had no idea that hooded pitohuis were toxic. They only found that out recently by chance.